TANKARD IS CRAZED AND HAS DISCOLOURED BADLY THE HANDLE HAS BEEN BROKEN OFF TAKING PART OF RIM AND REGLUED BADLY SEE BROWN BANDS TOP, BOTTOM AND NEAR PATTERN BANDS ON HANDLE THERE IS A LONG CRACK FROM RIM NEAR HANDLE ON TO STATUE AND A SMALL CRACK ON REVERSE SIDE AGAIN NEAR HANDLE. TANKARD IS CRAZED SHORT CRACK FROM RIM ABOVE HANDLE. REF 40/24/7/2 H.
Has a Certificate. in good condition. 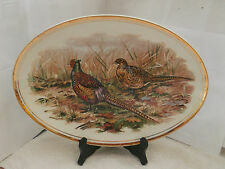 1957 SMALL OVAL PLATTER BY WEDGWOOD AND CO WITH A BANDED PATTERN. 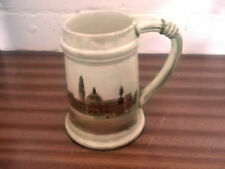 RARE ANCIENT SEAL OF DUNWICH POTTERY MUG LTD EDITION 192/500 GT YARMOUTH POTTERIES 11CM DEPICTING MONASTRY RUINS AND CHURCH AND THE ANCIENT SEAL OF DUNWICH. 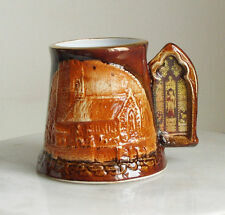 THIS MUG PRODUCED BY GREAT YARMOUTH POTTERIE WAS SOLD EXCLUSIVELY BY FLORA TEA ROOMS DUNWICH. This is number 174 of only 500 made. VICTORIAN T.BOOTH & SON 'VASE' B&W PATTERN SOUP PLATE c.1860's. A POT POURRI OF ANTIQUES, PERIOD PORCELAIN, GLASS & SILVER ALONG WITH UNUSUAL COLLECTABLES & ORIGINAL ART. Another one listed slight second. 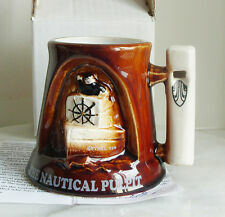 Great Yarmouth (Norfolk) pottery mug of The Lawns, Christmas 1994. has a litter bit of a slither on the base, has a hole firing flaw at the base of the handle. 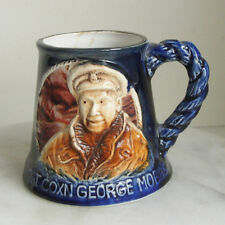 In good previously used condition, the glaze is shiny and the pattern is good, no cracks or crazing. This one is a rare black & white springer Spaniel. In excellent clean used condition. A POT POURRI OF ANTIQUES, PERIOD PORCELAIN, GLASS & SILVER ALONG WITH UNUSUAL COLLECTABLES & ORIGINAL ART. Stray paint spots & light crazing otherwise. VICTORIAN BISTO FLOW BLUE FLORAL DINNERWARE c.1880's. This lot is a 8" oct' Mint Tray. A POT POURRI OF ANTIQUES, PERIOD PORCELAIN, GLASS & SILVER ALONG WITH UNUSUAL COLLECTABLES & ORIGINAL ART. orders we obtain the most competative International Airfreight. This has the initials P K on the undersideThere is a small chip to the underside of the rim which is just visible when placed flat. including Blues oranges greens and yellows. SMALL CHIP TO REVERSE SIDE RIM OF ONE SAUCER DOES NOT SHOW ON FACE SIDE THERE ARE ALSO ON THIS SAUCER DRYING STAND MARKS NOT GLAZED. SIX SIDED FAIRLY DEEP BOWL WITH A PINK FLOWER PATTERN PLANT POT HOLDER, SHALLOW VASE DEEP FRUIT BOWL. PRE 1936 SMALL MILK / CREAM JUG IN MOTTLED PINK WITH A BLACK HANDLE AND A BLACK FLORAL BAND. NO CRACKS OR CRAZING GLAZE ONLY CHIP TO LIP RIM HAS TINY BROWN SPOTS ROUND IT DOES NOT FEEL CHIPPED JUST DISCOLOURED THERE ARE USAGE MARKS ON HANDLE MAKING IT A LITTLE WHITE IN PLACES. CRINOLINE LADY SET of SIX 6.5" SANDWICH PLATES EX. Colourful Lady in garden with floral brocade in gilt over cream ground. This lot is a Set of 6 Sandwich Plates. Vey popular pattern in the 40's/50's for Empire who closed in 1967. Lovely plate depicting two horses. It is in excellent condition.